Friends of Pike Creek Beaver Dam, a photo by photographerpainterprintmaker on Flickr. It’s been too long since I added a blog entry. Forgive me! I will be writing to you about our wonderful first ever group show soon. Even though the day was cloudy with a few sprinkles I managed to stay dry, and find light in the midst of this very grey day. The mosquitoes even left me alone for the most part. 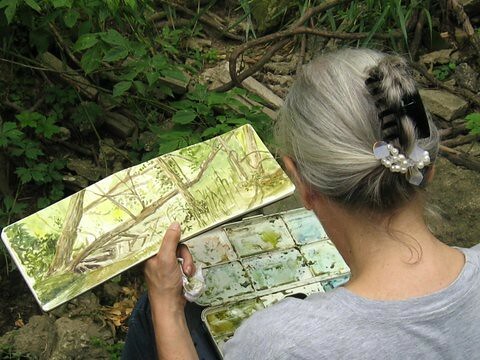 This watercolour is of a beaver dam in a little known conservation area just south of Windsor, On. It took a keen eye to find a scene, but we found some great ones! Hyram Walker’s Distillery from the other side of the tracks. Today found us doing a bit of Urban sketching. Even though Hyram Walker’s Distillery is now owned by Wisers, no one in Windsor calls the plant Wisers. Walkerville will always be Walkerville. 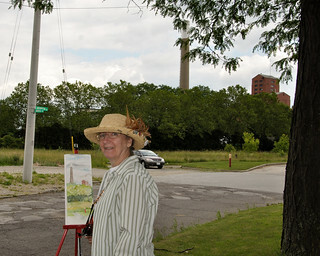 Anyway, in our group the Windsor & Essex County Plein Air Society we are starting to try out themes for our paint out locations. Todays them was Urban Sketching, or street scenes. I thought I’d try a bit different composition. Not sure how successful this particular subject was, but I will try it again sometime soon. 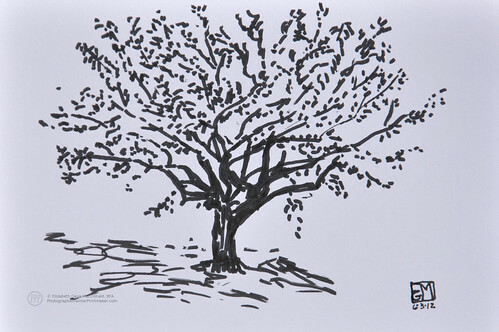 Brush pen sketch of a tree at Birch Run. We had a very busy week opening the trailer up near West Branch Michigan. What with leaves to rake, cleaning, and repairing broken stuff and leaky roofs, there was no time to sketch, or even take photo’s! On the way home we stopped at Birch Run. I stayed in the van and watched our dog while hubby ran into the shop to buy a couple shirts. I seized the opportunity to sketch this tree in front of the van.